If you don’t see them yet, you will over the next couple of weeks as they get rolled out: new AdWords reports in Google Analytics. What’s so new and great about them? 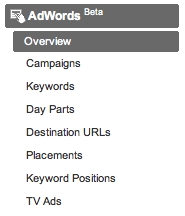 They’re still under Traffic Sources, which now shows the (rearranged) AdWords section with the new reports. 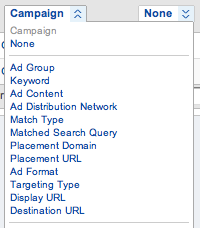 They’re not all new though: the Campaigns report (the mainstay of AdWords reporting) is still around, and so are Keyword Positions (which helps you see the distribution of your ads in various positions on the page) and TV Campaigns (for use with AdWords TV ads). The layout of those reports is basically the same (the Site Usage, Goal Sets, Ecommerce, and Clicks tabs are still there). But hidden in the dimension drop-down menus, you’ll find a variety of new options. Ad Distribution Network — did the ad appear on Google Search, Search Partners, or the Content Network? Match Type — was it a broad, phrase, or exact match keyword? Matched Search Query — what was the actual search query the user entered that triggered the ad? Placement Domain and URL — for Content Network ads, what sites/pages did they appear on? “Matched Search Query” alone is worth a pile of gold. No more kludges to figure out the search terms your broad match keywords matched! Now it’s easy as pie to find potential negative keywords and untapped potential for related keywords and phrases. With “Placement Domain” and “Placement URL”, we now also have much better data right within Google Analytics about Content Network ads and where they are shown. There are also a variety of brand-new reports. First of all, there’s an Overview report for the AdWords section which gives a nice summary. The Keywords and Placements reports simply show all the keywords and placements across all your campaigns, which is handy. Day Parts gives you data about your ads by day of the week or hour of the day. This is useful to see if you want to pause your ads during certain times when they don’t perform as well as you’d like. And finally, the Destination URLs report is a great way to see if certain landing pages work better than others. 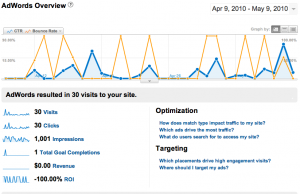 Think of it as the “Top Landing Pages” report but just for your AdWords ads. It’s easy to see which destination URLs lead to more conversions or lower bounce rates. So, that’s it. The changes are simple, but there’s a lot of power there with the new options. Take a look… If you don’t see these reports, you will soon — access is being rolled out to all accounts over the next few weeks.